You’ve been selected for a special assignment that will take you around the world photographing worldwide landmarks. Click here to play! If you’re successful, you’ll definitely line your pockets with plenty of green. The first stop on your list is Sydney, Australia. This city on the coast is where you’ll find the Sydney Opera House. This architectural landmark offers the highest payout in the game with two to five of them across an active payline fetching up to 1000 times your triggering bet. Next up is New York. The city that never sleeps is home to the Statue of Liberty. Lady Liberty will bring in up to 750 times your line bet if you can spin two to five of them across a payline. There are plenty of other stops on your journey. This includes Europe where you will snap the Leaning Tower of Pisa and the Eiffel Tower. Then on to London to capture Big Ben. You’ll also want to photograph the Heads of Easter Island, deserted Aztec cities, the Taj Mahal, and a few others. Now is your chance to travel the world to take in some of the modern marvels. 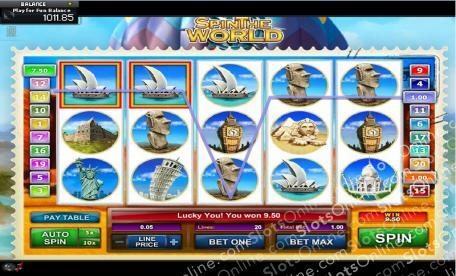 Capture pics of all these iconic landmarks across the reels and you’ll definitely pick up a very handsome payout.